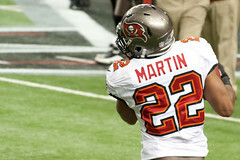 Tampa Bay running back Doug Martin, a first round draft pick in 2012, had a terrific first season in the NFL last season. He gained 1,454 yards rushing and picked up another 472 on 49 receptions. With the 1,454 yards rushing and 472 yards in receiving yards, Martin became only the ninth rookie since 1970 to amass those kinds of numbers in a season. In addition to Martin, two other running backs last season were members of the 1,000-400 Club. Buffalo’s C.J. Spiller had 1,244 yards rushing and 459 receiving yards for the Bills, and Ray Rice of the World Champion Baltimore Ravens had his fourth season (more on that in a moment) with 1,000-400. Rice had 1,143 yards rushing and 478 receiving yards in 2012. Following are the eight other rookie runners (in addition to Martin) who gained 1,000-plus yards rushing and 400-plus yards receiving in their first season in the NFL. Note: A season with 1,000-400 has happened 147 times in NFL history. It has been accomplished by 83 different running backs.